Crespelle is a traditional Italian dish featuring crepes served in a hot chicken broth. Aube Giroux shares more about this dish and her holiday traditions in the Kitchen Vignettes blog. In a large heavy-bottomed stock pot, sauté the chopped onion, celery and garlic over medium heat until translucent and fragrant. Add the whole or chopped chicken and add water to cover. Bring to a boil and then simmer, covered, for at least 3 hours. About an hour in, as the chicken cooks, you can use scissors to cut it into pieces to extract more flavour. After about 3 hours of simmering, strain everything out of the broth. Reserve the chicken meat for sandwiches or other recipes and use the bones to make a bone broth. Compost the veggies. Pour the strained broth back into the pot and if using, add the chopped carrot and potato, cooking for about 20 minutes. Once tender, use an immersion or stand blender to purée them into the broth, which will thicken it slightly. Add salt and pepper to taste. Keep broth warm on low heat until the crepes are ready. In a large mixing bowl, whisk the salt and flour. Make a well into the centre of the flour and crack all 6 eggs. Whisk together well and gradually add the water, a little at a time, whisking well to avoid lumps. After all the water has been added, if the batter is lumpy, you can run it through a fine-meshed sieve to get rid of any lumps. Grease up a heavy skillet, using about 1 tsp oil per crepe. Make the crepes using about 1/8 cup of batter per crepe. Swirl the batter around, cook for about 30 to 60 seconds on each side or until golden and bubbly. If the batter is too thick, add a little more water, a couple tablespoonfuls at a time. Stack the crepes on a large plate. Sprinkle a generous handful of grated cheese on each crepe and roll it up into a cigar shape. (Divide the cheese evenly among the crepes but save some for garnish). Place the rolled crepes seam down into a large serving bowl. 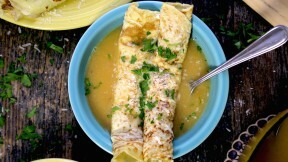 Serve two to three crepes per person and ladle a generous scoop or two of broth on top of the crepes. Garnish with a little cheese and chopped parsley. Enjoy!